Andy Kreyche of the IDA Santa Cruz Chapter believes that the night sky should be of interest to everyone. Kreyche has been involved with the Chapter in California for about two years, and now serves as one of its leaders. 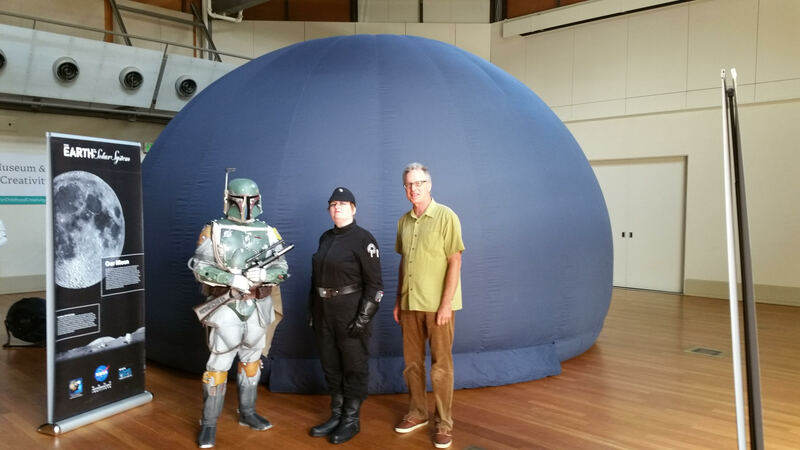 During International Dark Sky Week, IDA Santa Cruz collaborated with UC Santa Cruz and Lick Observatory to host their first event, Earth Night—a combination of science talks, presentations, and night sky observation. Earth Night events included a stunning visual presentation by Harun Mehmedinovic, co–founder of SKYGLOW Project. The evening symposium included talks about light and circadian rhythms, biodiversity and photodiversity, and observing the night sky. Presenters included Carrie Partch, a professor of chemistry and biochemistry; James Karl Fischer, founder of The Zoological Lighting Institute; Puragra (Raja) Guha Thakurta, a professor of astronomy and astrophysics; and Lisa Heschong, a fellow of the Illuminating Engineering Society. Members of the Santa Cruz and UC Santa Cruz Astronomy Clubs also presented to assist with the sky observation at the end of the night. Andy Kreyche also had an opportunity to speak. While Kreyche spends his days operating Dome on the Go, a mobile planetarium company, he says he’s “all about trying to get people to go out under the real sky.” Kreyche travels with his planetarium to schools and communities, trying to get kids interested in astronomy with hands-on activities and interactive experiences. An amateur astronomer, Kreyche fell in love with the night sky as a first grader, when his family moved to the Arizona desert. Once he had kids of his own, he wanted to share his love of the sky with them, so he volunteered to teach lessons about the solar system in their classes. Eventually, he got involved with Project ASTRO through the Astronomical Society of the Pacific and learned more techniques for communicating about the night sky. While his day job is providing an artificial experience of the night sky, Kreyche hopes that the experiences he provides will motivate some of the kids he interacts with to “get out and relate to the real night sky.” He vividly recalls reading books about planets when he was a kid and being inspired by the phenomenal desert sky. He’s also met professional astronomers who have told him that they got interested in the field when they went to the planetarium as a kid. His goal is to turn kids onto astronomy and to make it accessible to everyone—not just those who are gifted in learning science. He says, “I like to think that I’m serving a broader purpose,” and believes that it benefits everyone when we understand our place in the solar system.